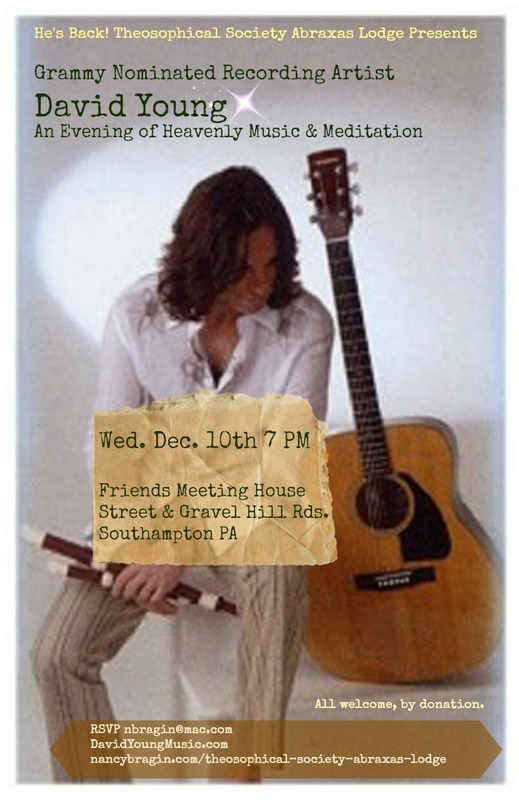 Wed. Dec. 10th – David Young and Heavenly Music in Southampton | Be Kind. We're all in this together. Open the door to the most profound spiritual experience of your life… two 30 minute meditations while David plays his flutes accompanied by a heavenly soundtrack, with a stretch break and discussion after each meditation. It has been said that more people have had out of body and spiritual experiences with David’s music than any other musician alive today, due to the profound healing qualities and higher energy vibration in his unique technique of playing two renaissance flutes at one time. David Young has sold over 1,000,000 CDs and has recorded 55 CDs. Over 10,000 healers of all kinds; reiki practitioners, massage and physical therapists, acupuncturists, chiropractors, spas and hospitals use his music every day for its healing qualities. Two of the people who were interviewed in the movie The Secret use David’s CD Creation as the meditation music in their workshops around the world. Marie Diamond, one of the speakers in that movie said she had “the most profound spiritual experience of my entire life” while David was performing. He was the first musician asked to perform live with Braco at his gazing sessions after he supplied the musical soundtrack for his DVD The Journey to Braco in 2012. Paul McCartney started a standing ovation for him at one of his events. This entry was posted in Uncategorized and tagged David Young Channeling George Harrison John Lennon, David Young Music, Southampton Events, Theosophical Society Abraxas Lodge. Bookmark the permalink.